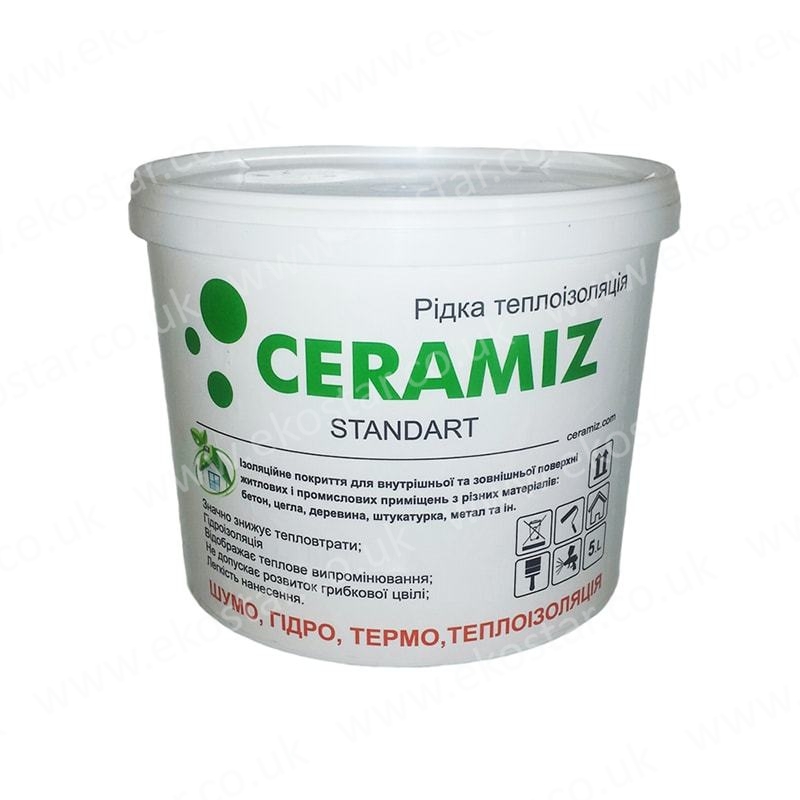 Ceramiz Standard Thermal Insulation is a coating, the main function of which is to provide a thermal insulation. However, both noise insulation and waterproofing are provided at the same time. Following application on the surface and drying out, a coating is received that can be of various colors – gray, white or any other. It has a certain degree of plasticity and elasticity. The additional functions of material are corrosion protection, water repellency (hydrophobic properties), heat insulation, etc. Material can be used for differing surfaces – brick, concrete, metal, wood, reinforced concrete and other materials. Among recommended fields of application are the following: water-pipe lines, air conduits, latches and latching mechanisms that should be protected from overheating, heating equipment, boilers, furnaces. Owing to a liquid consistency, application does not differ from usual paint, the same instruments are used – brush or roller. Ceramic materials for coating from a series of Ceramiz Standart have proved its high effectiveness and reliability for many years. Every material undergoes strict tests in verification for compliance with quality standards, therefore, any fault and deviations from the norm are impossible. Not only coefficient of thermal protection is verified, but also strength and elasticity that influences the durability of coating and optimal service properties. In addition to its basic qualities, this coating is used with the aim to decrease the weight of finished product, reduce the consumption of building materials as well as a comfort level of using different constructions and materials. It is important that thermal insulation permits use more rationally the energy for heating a building, this ensures a decrease of losses for heating. Owing to the structure, up to 99 % of heat is kept (thickness of coating 0.2-0.6 mm, heat conduction coefficient 0.0025 W/(m*К)). Ceramiz Ultra is a special thermal insulation, which after drying out forms elastic thermo-, waterproof- and noise insulation coating. It provides thermal insulating, anticorrosive, hydrophobic (water-repelling) and other protection of concrete, metal, reinforced concrete, brick, wooden, glass, rubber surfaces. The initial condition is the suspension of white color based on glass microspheres on the rubber base connected with water emulsion and polymer compound. In addition, the material guarantees protection from corrosion, hydrophobic properties, thermal insulation and other types of protection of wide variety of surfaces – concrete masonry and brickwork, wooden, metal and reinforced concrete elements. Insulation is used for pipes, pipelines, air-conduits with the purpose to prevent heat losses it is applied on the insulation valves, latches to avoid their overheating. It can be also applied on the surfaces of various equipment – heating boilers, kettles, furnaces, etc. Coating is used very simply, like a paint and plays the role of heat barrier. Coatings from Ceramiz Ultra series have repeatedly proved their effectiveness and reliability on different surfaces and under various conditions. All means of the series have passed a rigid control for compliance to quality standards therefore have excellent indicators of durability and elasticity. Owing to the specific structure, material insures optimal parameters of thermal insulation and long service life. As far as a consistency of thermal insulation resembles paint, it can be applied on any surfaces without any efforts. In addition to the main properties, the layer of liquid thermal insulation Ceramiz Ultra enables to decrease the weight of construction, reduce the consumption of building materials and increase the level of comfort and quiet in living quarters. Besides, thermal insulation has a positive effect on energy consumption for a heating of building. Its properties a coating realizes at the expense of physical phenomena of reflection, thermal conductivity, heat transfer.